This ware consisted of a transfer design to simulate the shagreen covered articles popular in the 1920’s. 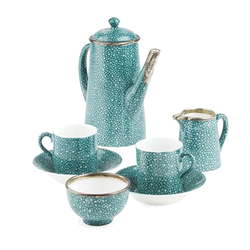 It occurs in green, blue and pink decorating coffee sets, powder bowls, ash trays and desk sets when it does turn up. China items often bear silver mounts marked G.B. & sons (George Betjeman) the once popular cabinet maker and high end retailer. 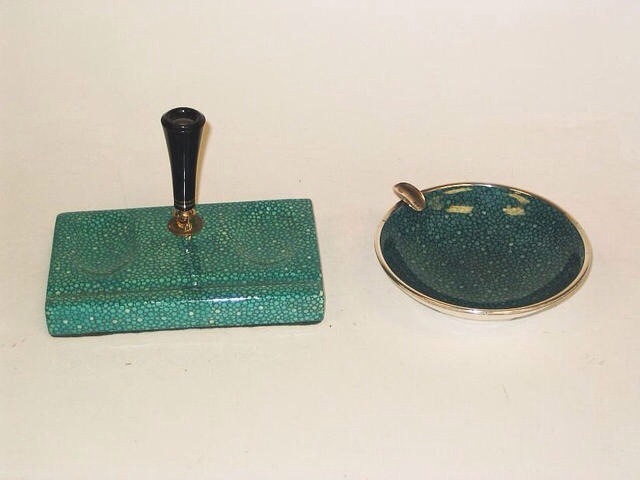 Hi, I have a pink Shagreen ashtray, with three sterling silver cigarette mounts on it, with hollow shaped centre. Is there a way I can email you with an image for your interest/review?